Fr. Ciriaco Olarte Y Pérez Mendiguren was born in Gomecha (Álava) on February 8, 1893 into a very religious family. Encouraged from childhood towards a priestly vocation. Oriented since childhood to priestly vocation September 21, 1904, he entered Redemptorist formation on September 21, 1904 at El Espino (Burgos) and professed his religious vows on September 8, 1911. 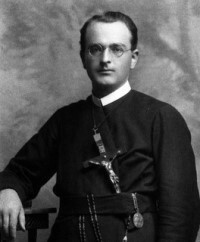 After being ordained a priest on July 29, 1917, he went to Mexico as a missionary from 1920 to 1926. He returned to Spain and the growing anti-clerical spirit in the Mexico of that time. From 1926 to 1935, he exercised his apostolic ministry in Madrid, at the community of Perpetual Help. In May 1935 he settled in Cuenca. In the evening of July 31, 1936, he was arrested and taken to the place called "Las Angustias" where, severely wounded, was left to die after long hours of agony.